I have an addiction to Converse. I believe I can trace it to the many viewings of "The Sandlot" my brother and I experienced in the 90's -- watching Rodriguez lace up those High Flyers before running to stop The Beast spurred me toward owning multiple pairs in later years. There's just something so inherently cool about Converse. I have multiple styles (star-embossed sneakers, the laceless, the classic Chuck Taylors) -- and, somehow, it's never enough. I can always justify just one more pair -- after all, those neon orange high-tops would look so cool with skinny leggings! 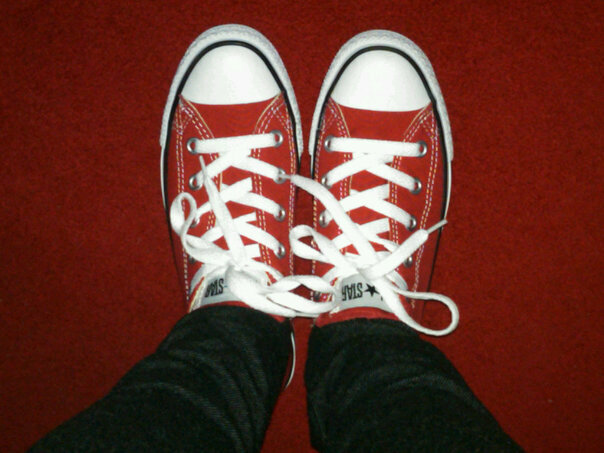 But for now, I'm contenting myself by rocking the low Chuck Taylors in red. I snapped them up at Famous Footwear during my last visit to Cleveland, and they've hardly left my feet since. I feel the day when I outrun a massive dog carrying my Babe Ruth baseball is just right around the corner. Converse Chuck Taylor All Stars retail for $45 at converse.com. Agreed! And my black ones with all the holes make me feel punk rock. Converse is the best! I have my basic black Chuck's, and they're the perfect shoes for a casual stroll.